Individual atoms consist of a nucleus of positive charge surrounded by one or more negative particles called electrons. To a rough approximation, the electrons circle the nucleus, somewhat as planets circle the Sun. Unlike the orbits of planets and asteroids around the Sun, which may be any size, the orbits of electrons in atoms turn out to obey a rather peculiar set of rules. In this case, the energy difference between the second and first orbit is Δ E = 6 - 1 = 5 units. We'll discuss details of the units in a moment. Now, if a photon of 5 units of energy happens to run into this atom, it might be absorbed by the atom, exciting the electron from the first orbit to the second orbit. Notice that the photon has disappeared. Once you have excited an atom, all you have to do is wait a bit; eventually, the atom will jump back down to a lower energy state, emitting a photon itself. The energy of this emitted photon is exactly equal to the difference in atomic energy levels between the initial and final states. In this example, the emitted photon would have 5 units of energy. that means that each type of atom will produce a set of emission lines at its own unique wavelengths. 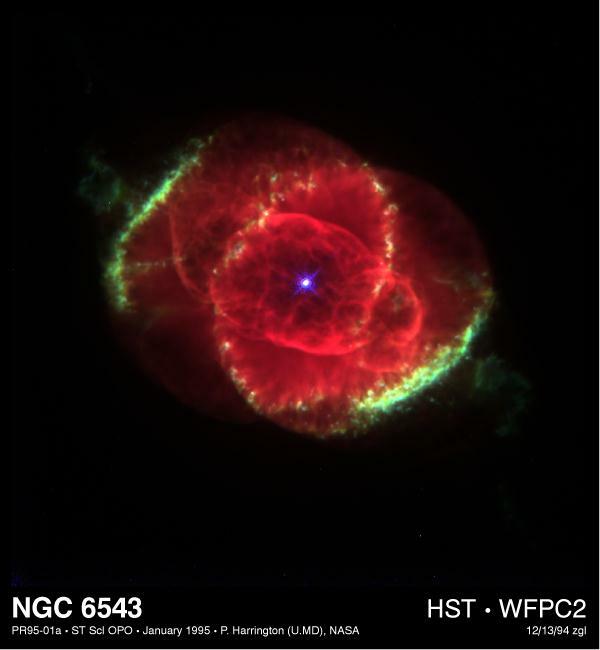 For example, consider hydrogen, the simplest (and most common) element in the universe. It consists of a single proton in its nucleus, around which a single electron orbits. Sometimes it helps to make a picture of the energy levels. We put the "ground state" level, n=1, at the bottom of the diagram. At the top, we put the level at which the atom will be ionized: if it gains this much energy, the electron flies off into space, never to return. We can depict an atomic transition graphically by drawing a little ball on the diagram to represent the energy of the atom. If the atom drops from a high level to a lower one, it will emit a photon. The energy of the photon is equal to the difference between the initial and final energy levels. Could you see that photon with your eye? Could you see this photon? Other atoms have spectra which are more complex than that of hydrogen; there are no simple formulae describing their energy levels. Fortunately, many scientists have spent years measuring the wavelengths of light emitted and absorbed by almost every variety of atom (and ion, and molecule) you can imagine. You can look up the wavelengths for any particular material in one of several big compilations of spectral lines. Absorption lines are based on the same physical principle as emission lines: they involve an atom jumping from one particular energy level to another. In this case, however, the jumps must be upwards, from a low level to a higher one. the hydrogen atom will absorb the photon and hop up to the n=2 level. through a cloud of hydrogen gas, we will see a dark absorption line at 121 nm. 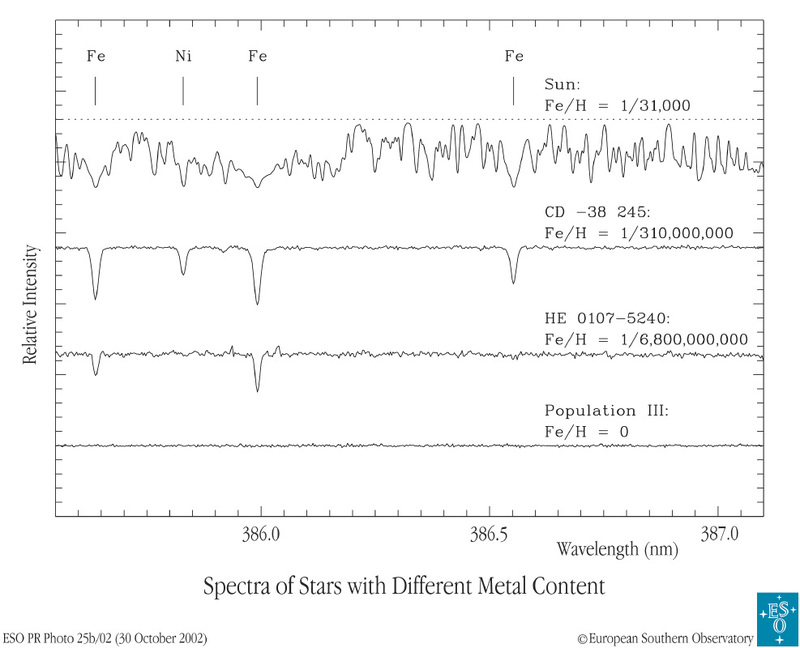 Below are a set of spectra of three different real stars and one theoretical, simulated star. 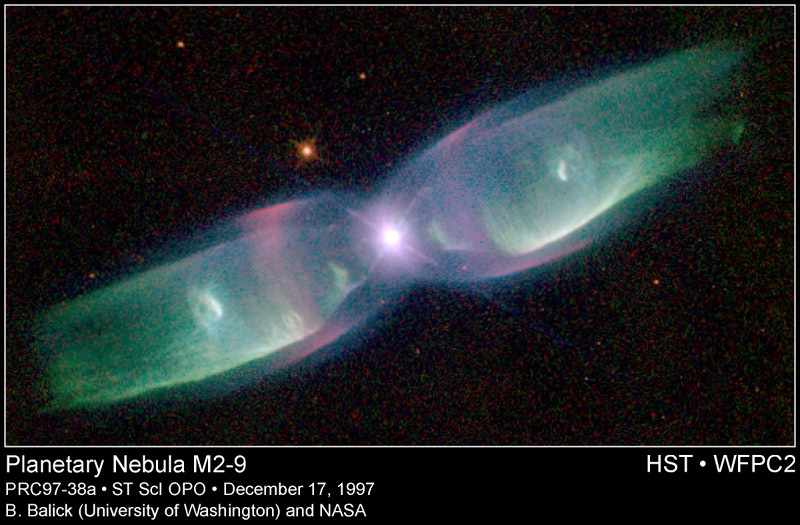 All three stars have similar temperatures in their photospheres, so the differences in the absorption lines of any one particular element do indicate differences in the abundance of that element. On the other hand, if you're not careful, spectral analysis might lead you astray. 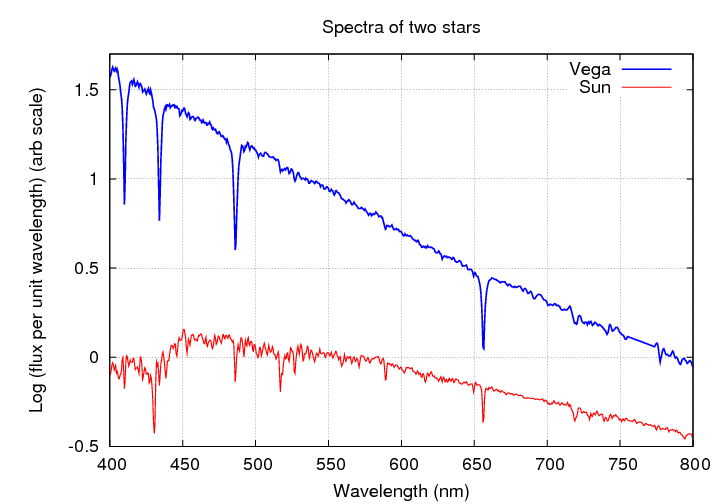 Let's compare the spectra of our own Sun with that of the bright star Vega. Here are the spectra shown as a graph, rather than as a picture. You can see the Balmer absorption lines of hydrogen in the spectrum of Vega very clearly. Q:  What element makes up most of the star Vega? Q:  What element makes up most of the Sun? dominate the spectrum of the Sun, too? The answer isn't obvious. In the early 1900s, astronomers didn't understand it, and they thought that IRON was one of the most common elements in the Sun's atmosphere, while hydrogen was a minor constituent. The person who solved this puzzle and figured out the true composition of the stars was a young woman named Cecilia Payne. 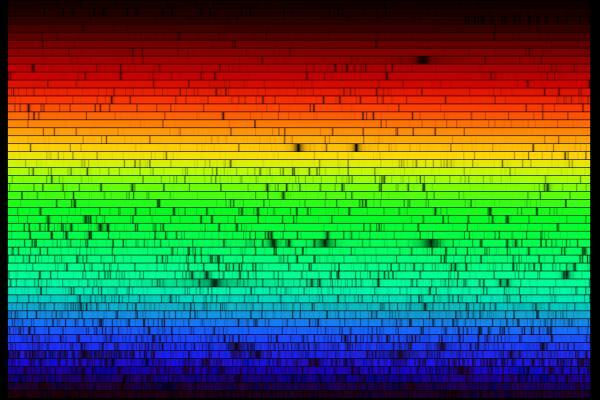 Look at the stellar spectrum below. Estimate the temperature of this star. One of the strongest lines in the spectrum above is due to a transition in sodium atoms. Which one is it? What is the wavelength, and what are the levels involved?